As November starts holiday spirit come with cold weather and snow. Some people don’t like snow at all, but some simply love it. As Wisconsin is in midwest it gets plenty of snow. There are a number of sports you can enjoy during snow season. Skiing is one of the activities in my Winter Bucket list. You can also enjoy Snowboarding, snow Mobil, sledding, and snow biking. I have never done any of it, so I decided to start with ski. 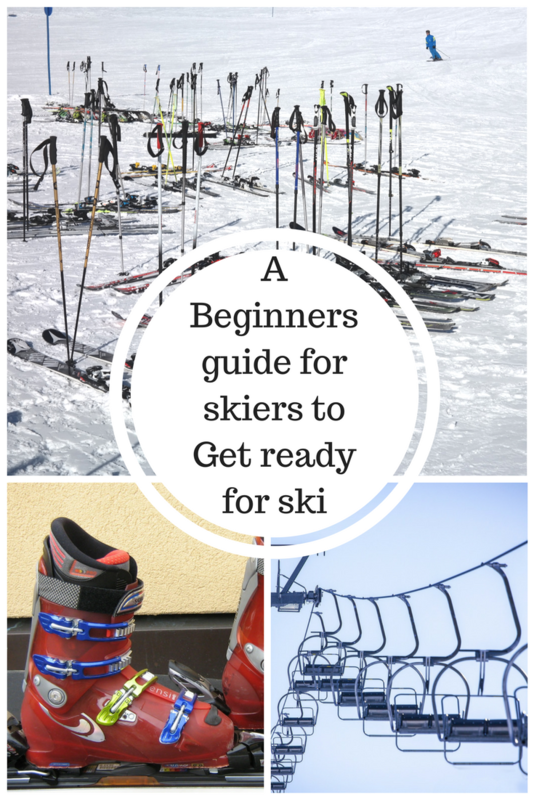 I went Skiing 1st-time last weekend and I realize everyone should have “A Beginners guide for skiers to Get ready for ski“. Hence I decided to put up all information and created this guide Everyone learns from mistakes and so did I. I was excited and scared too, so I decided to gather all the information one should know before going to ski. No one is an expert in everything, but you can learn new things at any age. So taking a ski lesson is advisable for first timers. The guidance will help you to learn faster. Almost all ski places provide lessons with different level. If you are skiing the first time then take level 1 class. Don’t hesitate to ask your doubts, feel free and enjoy your learning experience. Be careful when you select your outfit. Better to Dress in layers. Better to wear thermal or 32 degrees warmer for the base layer which keeps your body warm. Mid layer can be fleece, thick, full sleeve t-shirt and sweater. You can wear water-resistant jacket and bottom for the outer layer, so it won’t absorb moisture and get wet. Keep an extra sweater and jacket with you if in case you need one. Be prepared to beat the cold. Don’t forget to carry a winter hat with you. Also keep cotton balls to protect your ears. Wear Ski gloves or mittens. Ski gloves won’t get wet if in case you want to play with snow. If you are carrying your phone then keep it in the waterproof case. It is advisable that don’t buy ski equipment until you learn skiing. Hence it’s better to rent from the ski facility and once you are confident then only buy. There are ski rental facilities in respective ski areas. They provide Ski board, ski poles, and ski boots as well. If you are planning to use your own ski equipment then don’t forget to carry with you. Here is the list of recommended items to bring for skiing or snowboarding to make your trip memorable. Skiing is fun if you feel comfortable in cold atmosphere. So make sure you don’t forget anything. Synthetic or wool base layers for top & bottom – Synthetic is preferable, lease avoid cotton clothes. Extra clothes and shoes to change. Goggles/Sunglasses – Goggles are strongly recommended for increased visibility. You should Know your limits. Learning is fun, but don’t make it worse. If you feel tired then stop skiing. All ski places have outdoor sitting area. Have a seat and enjoy the energy around you. For some people cold weather is not suitable, so if you experience short of breathe and feel frostbite then stop skiing and get warm.